Down in the lair, Donnie interrupts Leo’s viewing of Space Heroes with urgent news. His sensors have detected the Kraang moving a large quantity of mutagen across the city; enough to mutate all of New York. The Turtles follow his tracking device and set out to stop the aliens. Arriving at the Kraang facility, they find only half the amount of mutagen on Donnie’s sensors. Much to his horror, he realizes they’ve already taken it somewhere, but he can’t track it with the equipment he has. 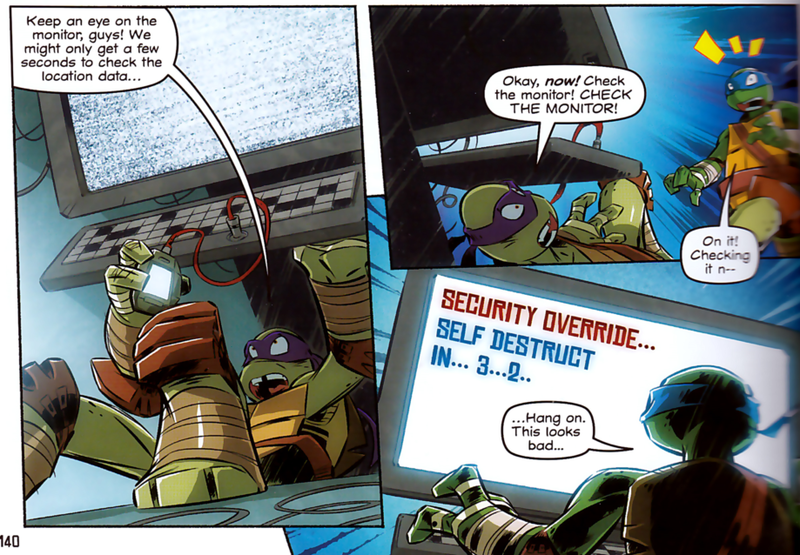 While Leo and the others keep the Kraangdroids busy, Donatello begins rewiring a computer to get it to display the coordinates of the mutagen shipment. The coordinates flash on the screen in front of Leo only moments before a self-destruct countdown. The other Turtles escape in time, but Leo is caught in the explosion. He recovers uninjured, but the blow to the head has left him thinking that he’s Captain Ryan from Space Heroes and that the other Turtles are his crew. 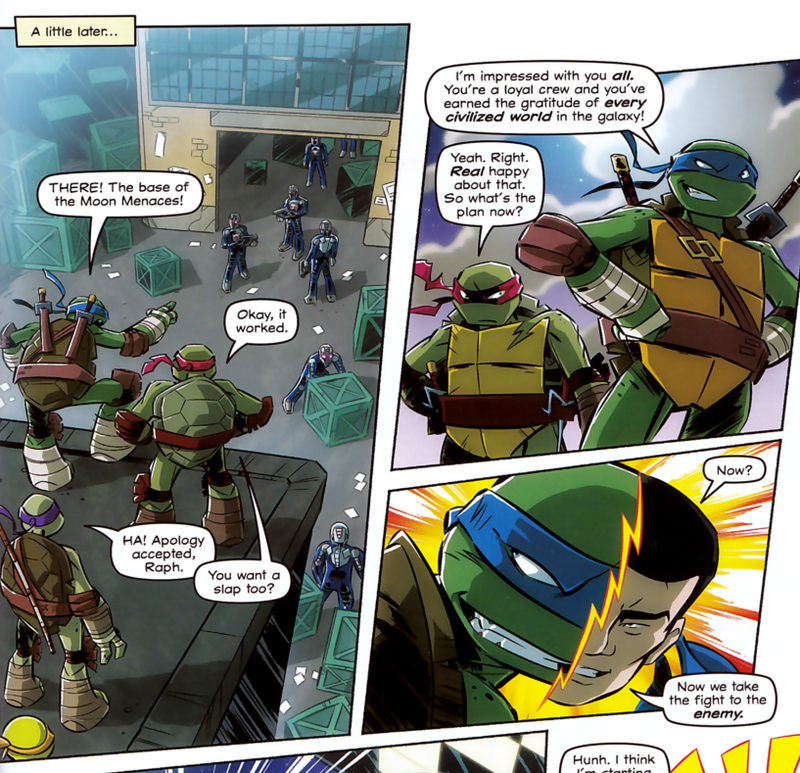 The Turtles initially try to subdue him, but Leo is hellbent on thwarting the scheme of the "Moon Menaces". Don realizes that Leo subconsciously absorbed the coordinates on the screen and so they have to play along if they want to find that shipment of mutagen. They follow Leo right to the Kraang facility and another fight breaks out. Donatello gets to work sabotaging the equipment to overload and destroy the mutagen. He does so and starts a self-destruct countdown. All the Turtles escape in time and the mutagen is destroyed. Suddenly, debris lands on Leo’s head and the blow restores him to normal. Everything seems fine and dandy until more debris lands on Raph. He comes to his senses, declaring himself to be the Shredder. The other Turtles flee in terror and Raph smirks (he was kidding). 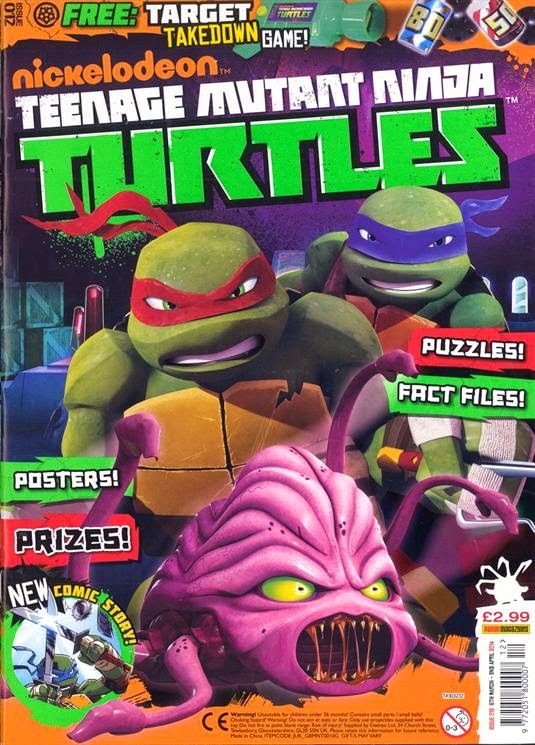 *This story is continued from TMNT Magazine (Panini) #11. 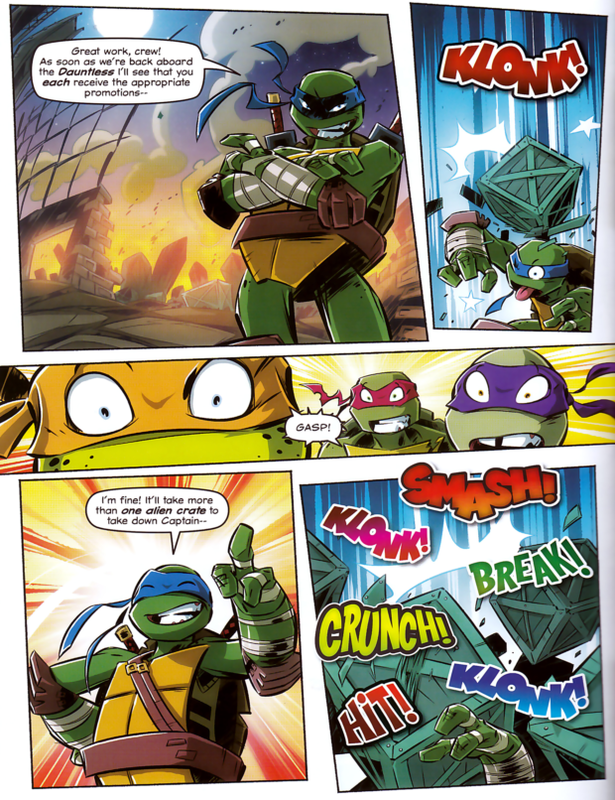 The story continues in TMNT Magazine (Panini) #13. One of the best recurring gags in the Nick TMNT cartoon is how every season spoofs an old cartoon for the purposes of background noise. They’re a lot of fun and even if they don’t amount to much more than said background noise, it’s something I’ve come to look forward to with each new season. But I think Space Heroes from season 1 had more substance than any of the others. There was a running gag where Leo would quote his idol Captain Ryan and modeled himself and his leadership style after the cartoon character. I loved that take on Leo; it was an idea we’d never seen before (that he could be inspired by media characters and not just Splinter and even had a nerdy hobby all his own). It made Leo an entertaining and amusing character for perhaps the first time ever, but it did so in a completely organic way that made sense in context and didn’t make him seem out of character. Then they ditched Space Heroes in season 2 for that Voltron thing and Leo never again had that entertaining, goofy quality. He went right to being the same old stuffy, boring Cyclops archetype he’s been in every other incarnation. It was a real loss. And he’s only gotten more brooding and serious in season 3. So going back and reading these comics that were made in the era of the first season, it reminds me of how much fun Leo was when the show began and what a great idea this was. All the more shame the writers squandered it in favor of "Classic Leonardo". The story by Walker and Caruana is perhaps a bit of a cliché; we see the “hit on the head, character thinks he’s someone else, hijinks ensue” plot frequently in cartoons. Heck, didn’t Leo take a blow to the head and think he was d’Artagnan in the ‘80s cartoon? But as with every cliché, it really boils down to how you handle it and the writers really pepped the old plot up with a lot of snappy dialogue and comic timing. Speaking to that latter bit about “comic timing”, Cosmo White really nails the laughs with his stylish and energetic layouts and expressions. This is a very frantic story, even by the standard of the Panini TMNT comic (which often rushes through its adventures due to the limited page space), but the hyperactive approach to both the script and the art also make it very exciting and fun to read. Overall, maybe I like this story so much because it reminded me of something Leo lost in the transition between seasons of the cartoon, but I do think it’s a very funny story in its own right with more of the excellent art and colors that set Panini’s TMNT cartoon comic above its competition at IDW. I don't know if anybody on the forum got this one. I'm sure if You ask, they'd scan it. I don't mind photoshopping it. I got the German version of this magazine, and the comic inside is titled "Space Captain Leo" - although it is a common feature for German titulations to radically differ from their English originals. The story is about Leo bumpingh is head whilst stopping another Kraang plot and henceforh believes he is Space Heroes' Captain Ryan! Thanks! I'll add the title to the contents listing for posterity's sake. The comic SHOULD be in the recent trade paperback collection, which I intend to pick up once Book Depository restocks it (it sold out in the first day).